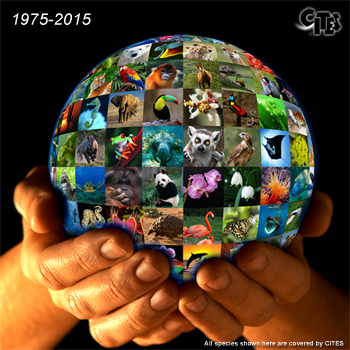 Geneva, 1 July 2015: The efforts of the 181 Parties to CITES to combine international cooperation with national action are being recognized on the 40th anniversary of CITES entering into force on 1 July 1975. Since 1975 when CITES came into force the world has witnessed growing prosperity, changing consumption and production patterns, vastly enhanced scientific knowledge, phenomenal advances in technology and, above all, exponential growth in global trade. Looking at population figures alone, the world’s population has grown from 4 to over 7 billion people – and that is an additional 3 billion potential consumers of wildlife and wildlife products. On the eve of the 40th anniversary CITES Secretariat released several new publications on the efforts being taken under CITES to ensure certain shark species are not over exploited through international trade. A high level side event was also held in Bonn at the 39th Session of the World Heritage Committee co-sponsored by Germany and the CITES Secretariat, together with the Convention on Migratory Species and the Wildlife Conservation Society (WCS), on the threats posed by poaching and illegal trade in wildlife to World Heritage sites across Africa and the collaborative efforts that are underway to combat these serious crimes. These threats were highlighted by UNESCO Director-General Bokova and Secretary-General Scanlon in a joint oped published in June 2013. The side event follows decisions taken at the 38th Session of the World Heritage Committee that called for the World Heritage Centre to strengthen its cooperation with the CITES Secretariat. Operation Cobra III was completed, involving 62 countries from across Africa, America, Asia and Europe, making it the largest ever international coordinated effort to combat wildlife crime. CITES announced the CITES Trade Database, established in 1978, has exceeded 15 million records of trade, which is publicly available information and serves to show the increasing use of CITES to regulate international wildlife trade. The UN Congress on Crime Prevention and Criminal Justice included reference to trafficking in wildlife and the serious problems caused by such crimes in the Doha Declaration adopted by the Congress. GEF announced new funding of a global wildlife programme to reduce the impacts of poaching and illegal trade on protected species, following CITES drawing the attention of the GEF Council to the immediate threats posed by illegal trade in wildlife in 2011 and asking the GEF to make funding available to combat this illegal trade. CITES and IATA joined forces to reduce illegal trade in wildlife and their products, as well as to ensure the safe and secure transport of legally traded wildlife. CITES and WTO marked two decades of successful collaboration through the launch of a landmark publication on the relationship between the WTO and CITES as a leading example of how global trade and environmental regimes can support each other and cooperate successfully to achieve shared goals, noting that there has never been any WTO dispute directly challenging a CITES trade-related measure. The European Union acceded to CITES and will become the 181st Party on 8 July 2015 giving CITES near universal coverage, with another five States being in the process of acceding to CITES. The Encyclical Letter of the Holy Father Francis on Care for Our Common Home references the importance of enforceable international agreements and makes positive reference to CITES (see paragraph 168). This year the Sustainable Development Goals (SDGs) will be adopted by the UN General Assembly. CITES has much to contribute to the proposed SDGs, including Goal 15 which aims to: protect, restore and promote sustainable use of terrestrial ecosystems, sustainably manage forests, combat desertification, and halt and reverse land degradation and halt biodiversity loss; and Goal 14, which aims to conserve and sustainably use the oceans, seas and marine resources for sustainable development. The importance of CITES was recognized in the outcomes of Rio+20 in 2012 in which it was described as “an international agreement that stands at the intersection between trade, the environment and development, promotes the conservation and sustainable use of biodiversity, should contribute to tangible benefits for local people, and ensures that no species entering into international trade is threatened with extinction”. The United States of America, Nigeria, Switzerland, Tunisia, Sweden, Cyprus, United Arab Emirates, Ecuador, Chile and Uruguay. While CITES was the third global multilateral environment agreement to be adopted, it was the first such agreement to enter into force. 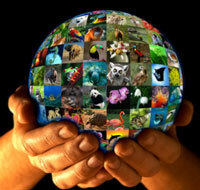 UN World Wildlife Day is celebrated on 3 March each year, the date of adoption of CITES (in 1973) in Washington D.C. In 2015 the theme was ‘It’s time to get serious about wildlife crime’. The 17th meeting of the Conference of the Parties (CoP) will take place in Johannesburg, South Africa from 24 September to 5 October 2016. The decision follows an offer by South Africa to host the 17th meeting of the Conference of the Parties (CoP17) which was accepted by acclamation at the 16th meeting of the Conference of the Parties (Bangkok, March 2013). This will be the fourth meeting of the Conference of the Parties to CITES held on the African continent since CITES came into force on 1 July 1975, but the first on the continent since 2000.